Conifer is a destination known for its beautiful mountain scenery and abundance of wildlife. In the early days, the area was mostly known as a cattle ranching area. Though there is still some ranching in these parts, its grown up a bit since the early days. Nowadays it serves a quiet getaway location that is still close enough to commute the the city for work and yet far enough away to leave the hustle and bustle of the city behind and enjoy the beautiful scenery that abounds. Conifer’s population was reported to be about 20,000 residents in 2015. This quiet community is nestled in the foothills of the Rocky Mountains, just 35 miles southwest of downtown Denver. More than 75% of the working community is employed in the Denver metro area and also shops in the Denver area. However, planned commercial development in the area will lower that percentage. The new King Soopers and Safeway grocery stores and shopping areas along Highway 285 have greatly expanded local shopping options. If you are seeking to learn more about real estate listings in Conifer and see new homes for sale in the area, please look around and don’t hesitate to get in touch. What does stand out is this town’s abundance of natural beauty. The Pike National Forest, which runs right through town, provides a home for deer, elk, foxes, birds and rabbits. In the spring and summer, seasonal wildflowers carpet Conifer’s hills. The city also maintains multiple parks. 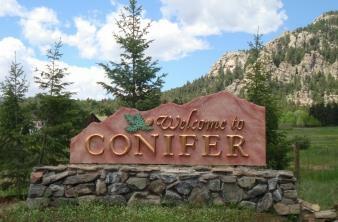 To learn about things to do and local attractions in Conifer, visit Colorado.com Conifer page. Visit the GoConifer – Chamber of Commerce website for information about doing business in the area.